For the administrative subdivision, see Tulcea County. Tulcea (Romanian pronunciation: [ˈtult͡ʃe̯a]; Bulgarian, Russian and Ukrainian: Тулча, Tulcha; Greek: Αιγισσός, Aegyssus; Turkish: Hora-Tepé or Tolçu) is a city in Dobruja, Romania. 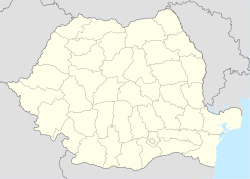 It is the administrative center of Tulcea County, and had a population of 73,707 as of 2011[update]. One village, Tudor Vladimirescu, is administered by the city. ^ a b c d Stănică, Aurel (2004). "Tulcea. Un centru economic la Dunărea de Jos în secolul al XVI-lea". Peuce. S.N. Tulcea: Institutul de Cercetări Eco-Muzeale. II(XV): 199. ISSN 0258-8102. ^ Laiou, A. E. Constantinople and the Latins (Foreign Policy of Andronicus II, 1282-1328). Cambridge, Massachusetts, 1972. Laiou, A. E. Constantinople and the Latins (Foreign Policy of Andronicus II, 1282–1328). Cambridge, Massachusetts, 1972. This page was last edited on 13 March 2019, at 16:40 (UTC).